Update: MU OET Result is expected to be announced in the last week of May 2019. Along with result MAHE will also release Cut Off and Merit List on the official website. After all these stuff qualified candidates will be called for Counselling Process. The result is expected in the 4th week of May 2019, and other events are listed here. 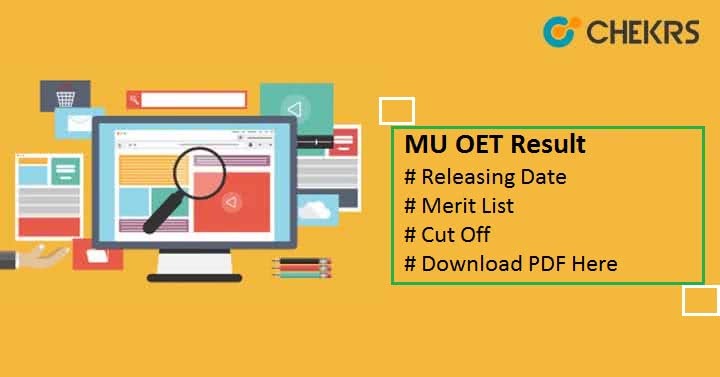 All the Appeared candidates can download their MU OET Result 2019 and also Merit/ Cut Off List By Going through the following steps. Go to the official website i.e. manipal.edu. Click on ‘Admissions’ tab located on the navigation bar of the page. Select ‘MU OET 2019 Results’ link. Now Enter your MET Application Number and Password. That’s it, Your result will appear on the screen check the result and also download it. The Exam Authority will release the Merit list and announce Cut Off on the Same admission page, Candidate have to follow the almost same procedure to get the MU OET Merit List 2019 and Cut Off Marks. On the basis of Cut Off marks Candidates will be ranked on The Merit List. Candidates who qualified the exam and got more than Cut Off Marks and having name in Merit List will be called for Counselling Round. After Checking the name in the merit list candidates have to follow these procedure for getting the final admission. Candidates have to also verify all their documents before or at the time of Admission. List of Documents are as follows. Original copy of 10th/ 12th class mark sheet. That’s it guys, I hope You will find this Article informative. Now, If you want to check more details about MU OET Counselling Procedure. You can get it in a separate Article. Till than Good Bye and Keep Visiting.